No fairy princess is complete without her halo and wand. 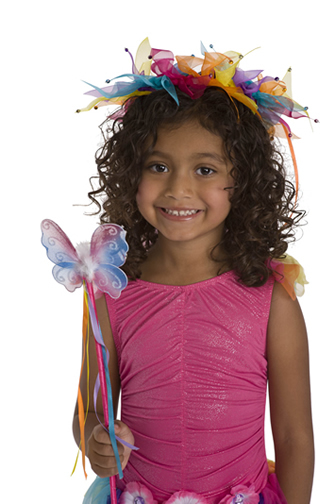 The rainbow ribbon halo and butterfly wand set made of flowing streamers and glittering gems are the perfect addition. The halo sits atop the head with a flexible plastic headband, and the wand has a thick, durable handle. They coordinate beautifully with our adorable fairy dress ups. WARNING: Choking Hazard: Small Parts. Not for children under 3 yrs. My grand daughter opened her halo & wand on Christmas morning and has worn it every day since. Very colorful, great quality. This fairy halo arrived looking just as pictured. It is bright and colorful and very unique. I found nothing else like this online. My Niece loves it!